3NASA/Ames Research Center, Moffett Field, California, USA. Eckhard D. Falkenberg, who found evidence of an annual oscillation in the beta-decay rate of tritium, was either the first or one of the first to propose that some beta-decay rates may be variable . He suggested that the beta-decay process may be influenced by neutrinos, and attributed the annual variation to the varying Earth-Sun distance that leads to a corresponding variation in the flux of solar neutrinos as detected on Earth. Supporting evidence for the variability of beta-decay rates could be found in the results of an experiment carried out at the Brookhaven National Laboratory. Alburger et al. had measured the decay rates of 36Cl and of 32Si from 1982.13 to 1986.13 (later extended to 1989.93), and reported finding “small periodic annual deviations of the data points from an exponential decay … of uncertain origin” . In 2006, Fischbach and Jenkins of Purdue University set up an experiment to track the decay rate of 54Mn as part of a project to determine whether or not beta decays are strictly random. They found, as had Falkenberg, that the decay rate appeared to be variable. This led them to examine the publication of Alburger et al. and an article by Siegert et al. concerning measurements of the decay rates of 226Ra acquired at the Physikalisch Technische Bundesanstalt in Germany. Jenkins and Fischbach proposed, as had Falkenberg, that the beta decay process may be influenced by solar neutrinos, and that the annual variation may be due to the varying Earth-Sun distance . They also found evidence of a notable variation in the decay rate at the time of a solar flare on December 13, 2006, which led them to suggest that the beta decay process may somehow influence or be influenced by solar activity . Although these two suggestions (that an annual oscillation in beta decays is due to the varying Earth-Sun distance and that beta decays are somehow correlated with solar activity) have not been substantiated by subsequent investigations, their articles were effective in drawing attention to the possibility of decay-rate variability. Contrary to what one might hope for, but in line with reality, their suggestions quickly led to several nay-saying articles [6,7,8], to which Fischbach and his colleagues responded [9,10,11]. More recently, Kossert and Nahle have claimed to have evidence that beta-decay rates are constant , but their claims have been refuted . The latest such article is one by Pomme et al. , who have published data concerning 67 measurements of a variety of decay processes, examining the measurements only for evidence of an Earth-Sun-Distance effect (which is known to be an inadequate test of variability) and claim to establish that there is no such effect. Their data have not yet been subjected to an independent analysis. Although the first evidence for variability was the discovery of annual oscillations in decay rates, this approach to the problem has the obvious defect that an annual variation may be caused by any one of several experimental or environmental influences, which led us to seek evidence for an influence of solar rotation. We have learned from helioseismology that the synodic rotation rate (as seen from Earth) of the radiative zone is in the range 12.5 to 12.8 year-1, whereas the synodic rotation rate of the photosphere extends to 13.8 year-1 . Variation of the solar neutrino flux may be attributable to the RSFP (Resonant Spin Flavor Precession) process , which can more easily occur in the deep solar interior (where there can be much stronger magnetic field) than in the convection zone . This scenario would not lead one to expect an association between decay-rate variations and flare-like solar activity, which takes place in the outermost layer of the convection zone and in the solar atmosphere. Power spectrum analysis of BNL data has in fact yielded evidence of oscillations in the frequency range 11 – 13 year-1, supporting our conjecture that there may be a rotational influence on the solar neutrino flux [18,19]. However, these results raised the question of whether one could find corresponding evidence for solar rotation in measurements of the solar neutrino flux made by neutrino observatories such as Super-Kamiokande. An analysis of Super-Kamiokande data that takes account only of the mid-time of each bin, ignores the error estimates, and adopts an unrealistically wide search band, yields inconclusive results , but an analysis that takes account of the start and stop time of each measurement bin and of the upper and lower error estimates, and adopts an appropriate search band, yields strong evidence of an oscillation of frequency 9.43 year-1 . A crucial issue is whether or not solar influences are steady or time variable. Our investigations of GALLEX solar neutrino data indicated that the influence of rotation tends to be episodic . 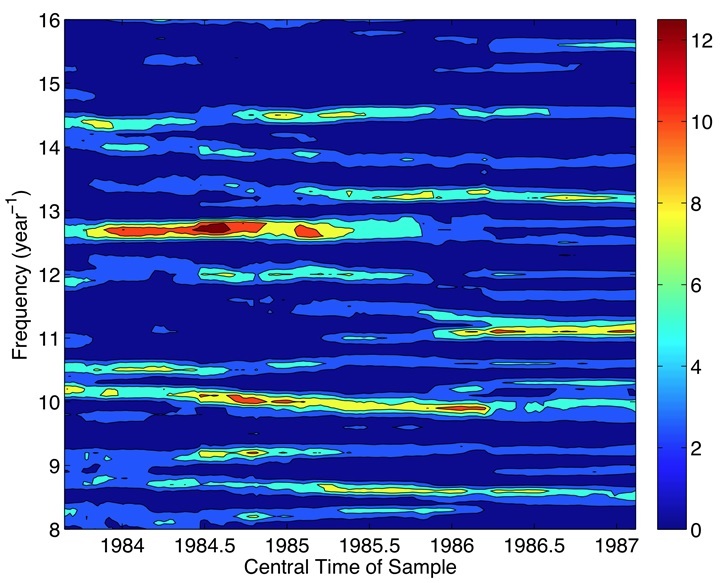 This suggested that one should examine neutrino and beta-decay data by means of spectrograms rather than periodograms. These considerations led us to carry out a comparative analysis of spectrograms formed from the BNL data and from Super-Kamiokande data. The results have recently been published in Solar Physics . Figure 1. Spectrogram formed from 36Cl data for the frequency band 8 – 16 year-1. Figures 1 and 2, taken from that article, show spectrograms formed from BNL 36Cl and 32Si data, respectively. In order to focus on possible evidence of solar rotation, we show spectrograms only for the frequency range 8 to 16 year-1. Figure 1 shows evidence of strong but transient oscillations at frequencies of approximately 11 year-1 and 12.6 year-1. Figure 2 also shows evidence of an oscillation at approximately 12.6 year-1, but only slight evidence of an oscillation at approximately 11 year-1. Evidence of these two oscillations has previously been found in power-spectrum analyses [18,19]. Figure 2. Spectrogram formed from 32Si data for the frequency band 8 – 16 year-1. 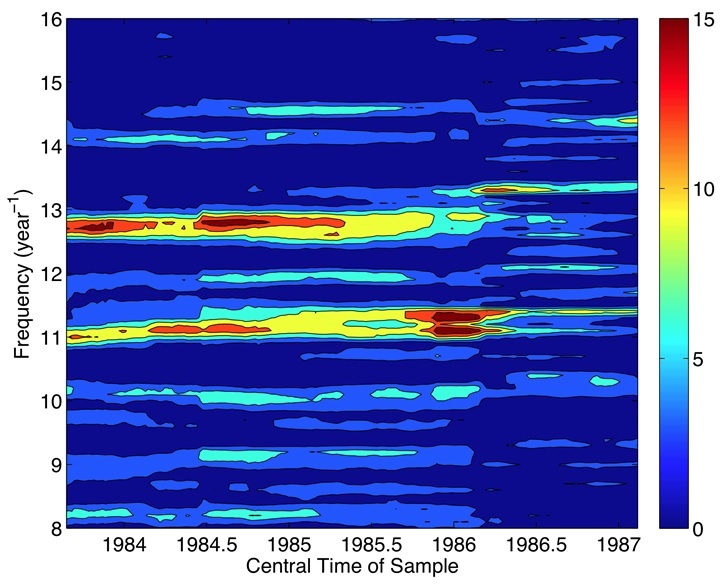 Figure 3 shows a spectrogram formed from Super-Kamiokande data, again for the frequency range 8 – 16 year-1. This spectrogram shows evidence of a strong and steady oscillation at approximately 9.5 year-1, as expected from our earlier power-spectrum analysis . However, it also shows evidence of a transient oscillation with a frequency of approximately 12.6 year-1, supporting the proposition that beta-decay variability may be attributed to an influence of solar neutrinos. Figure 3. Spectrogram formed from Super-Kamiokande data for the frequency band of 8 – 16 year-1. The schedules of the relevant experiments were such that measurements leading to Figures 1 and 2 and measurements leading to Figure 3 were not acquired at the same time. It would clearly be desirable to compare beta-decay measurements and solar neutrino measurements that are acquired in the same time frame. 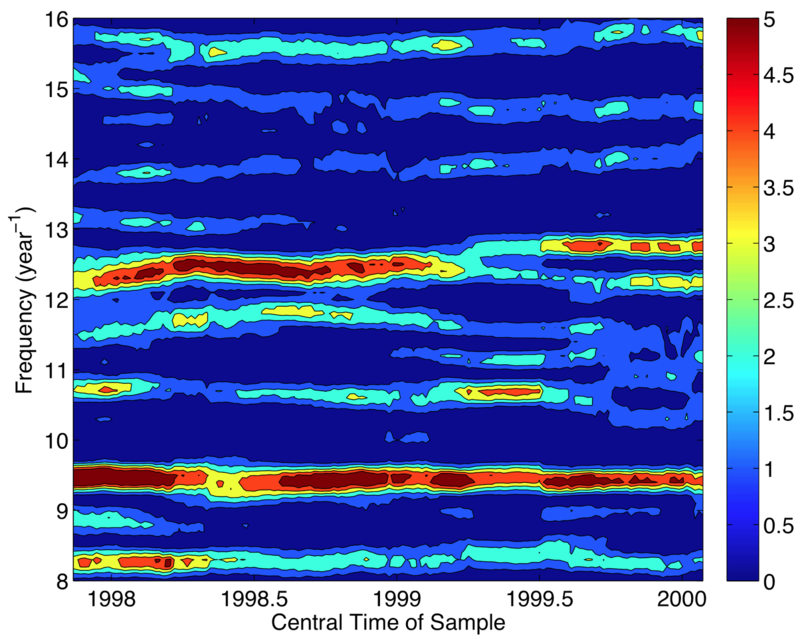 The most extensive set of beta-decay measurements is the sequence currently (beginning in early 1992) being acquired by Steinitz and his colleagues at the Geological Survey of Israel (GSI) [24, 25]. The Borexino solar neutrino experiment began operation in 2007 and is still operational , so it may be possible at some time to compare beta-decay data with contemporaneous solar-neutrino data. It is however important to note that one may not find a perfect match between the two sets of data, even if beta decays are in fact influenced by neutrinos, since beta decays and neutrino detectors may respond to neutrinos of different energies and (since we have no theoretical understanding of beta-decay variability) conceivably of different flavors. Eckhard Dieter Falkenberg, "Radioactive Decay Caused by Neutrinos? ", Apeiron, 8, 32 (2001). Full Article. D.E. Alburger, G. Harbottle, E.F. Norton, "Half Life of 32Si", Earth and Planetary Science Letters, 78, 168 (1986). Abstract. Helmut Siegert, Heinrich Schrader, Ulrich Schötzig, "Half-life measurements of Europium radionuclides and the long-term stability of detectors", Applied Radiation and Isotopes, 49, 1397 (1998). Abstract. Jere H. Jenkins, Ephraim Fischbach, John B. Buncher, John T. Gruenwald, Dennis E. Krause, Joshua J. Mattes, "Evidence of correlations between nuclear decay rates and Earth–Sun distance", Astroparticle Physics, 32, 42 (2009). Abstract. Jere H. Jenkins, Ephraim Fischbach, "Perturbation of nuclear decay rates during the solar flare of 2006 December 13", Astroparticle Physics, 31, 407 (2009). Abstract. Peter S. Cooper, "Searching for modifications to the exponential radioactive decay law with the Cassini spacecraft", Astroparticle Physics, 31, 267 (2009). Abstract. Eric B. Norman, Edgardo Browne, Howard A. Shugart, Tenzing H. Joshi, Richard B. Firestone, "Evidence against correlations between nuclear decay rates and Earth–Sun distance", Astroparticle Physics, 31, 135 (2009). Abstract. T.M. Semkowa, D.K. Hainesa, S.E. Beacha, B.J. Kilpatricka, A.J. Khana, K. O'Brienb, "Oscillations in radioactive exponential decay", Physics Letters B, 675, 415 (2009). Abstract. D.E. Krause, B.A. Rogers, E. Fischbach, J.B. Buncher, A. Ging, J.H. Jenkins, J.M. Longuski, N. Strange, P.A. Sturrock, "Searches for solar-influenced radioactive decay anomalies using spacecraft RTGs", Astroparticle Physics, 36, 51 (2012). Abstract. D. O’Keefe, B.L. Morreale, R.H. LeeJohn, B. Buncher, J.H. Jenkins, Ephraim Fischbach, T. Gruenwald, D. Javorsek II, P.A. Sturrock, "Spectral content of 22Na/44Ti decay data: implications for a solar influence", Astrophysics and Space Science, 344, 297 (2013). Abstract. Jere H. Jenkins, Daniel W. Mundy, Ephraim Fischbach, "Analysis of environmental influences in nuclear half-life measurements exhibiting time-dependent decay rates", Nuclear Instruments and Methods in Physics Research Section A. 620, 332 (2010). Abstract. Karsten Kossert, Ole J. Nähle, "Disproof of solar influence on the decay rates of 90Sr/90Y", Astroparticle Physics, 69, 18 (2015). Abstract. P.A. Sturrock, G. Steinitz, E. Fischbach, A. Parkhomov, J.D. Scargle, "Analysis of beta-decay data acquired at the Physikalisch-Technische Bundesanstalt: Evidence of a solar influence", Astroparticle Physics, 84, 8 (2016). Abstract. S. Pomméa, H. Stroh, J. Paepen, R. Van Ammel, M. Marouli, T. Altzitzoglou, M. Hult, K. Kossert, O. Nähle, H. Schrader, F. Juget, C. Bailat, Y. Nedjadi, F. Bochud, T. Buchillier, C. Michotte, S. Courte, M.W. van Rooy, M.J. van Staden, J. Lubbe, B.R.S. Simpson, A. Fazio, P. De Felice, T.W. Jackson, W.M. Van Wyngaardt, M.I. Reinhard, J. Golya, S. Bourke, T. Roy, R. Galea, J.D. Keightley, K.M. Ferreira, S.M. Collins, A. Ceccatelli, M. Unterweger, R. Fitzgerald, D.E. Bergeron, L. Pibida, L. Verheyen, M. Bruggeman, B. Vodenik, M. Korun, V. Chisté, M.-N. Amiot, "Evidence against solar influence on nuclear decay constants", Physics Letters B, 761, 281 (2016). Abstract. J. Schou, R. Howe, S. Basu, J. Christensen-Dalsgaard, T. Corbard, F. Hill, R. Komm, R. M. Larsen, M. C. Rabello-Soares, M. J. Thompson, "A Comparison of Solar p-Mode Parameters from the Michelson Doppler Imager and the Global Oscillation Network Group: Splitting Coefficients and Rotation Inversions", Astrophysical Journal, 567, 1234 (2002). Abstract. E. Kh. Akhmedov, "Resonant amplification of neutrino spin rotation in matter and the solar-neutrino problem", Physics Letters B, 213, 64 (1988). Abstract. João Pulido, C R Das, Marco Picariello, "Remaining inconsistencies with solar neutrinos: Can spin flavour precession provide a clue? ", Journal of Physics: Conference series, 203, 012086 (2009). Abstract. P.A. Sturrock, J.B. Buncher, E. Fischbach, J.T. Gruenwald, D. Javorsek II, J.H. Jenkins, R.H. Lee, J.J. Mattes, J.R. Newport, "Power spectrum analysis of BNL decay rate data", Astroparticle Physics, 34, 121 (2010). Abstract. D. Javorsek II, P.A. Sturrock, R.N. Lasenby, A.N. Lasenby, J.B. Buncher, E. Fischbach, J.T. Gruenwald, A.W. Hoft, T.J. Horan, J.H. Jenkins, J.L. Kerford, f, R.H. Lee, A. Longman, J.J. Mattes, B.L. Morreale, D.B. Morris, R.N. Mudry, J.R. Newport, D. O’Keefe, M.A. Petrelli, M.A. Silver, C.A. Stewart, B. Terry, "Power spectrum analyses of nuclear decay rates", Astroparticle Physics, 34, 173 (2010). Abstract. J. Yoo et al. (Super-Kamiokande Collaboration), "Search for periodic modulations of the solar neutrino flux in Super-Kamiokande-I", Physical Review D, 68, 092002 (2003). Abstract. P.A. Sturrock, J.D. Scargle, "Power-Spectrum Analysis of Super-Kamiokande Solar Neutrino Data, Taking into Account Asymmetry in the Error Estimates", Solar Physics, 237, 1 (2006). Abstract. P.A. Sturrock, "Time–Frequency Analysis of GALLEX and GNO Solar Neutrino Data", Solar Physics, 252, 1 (2008). Abstract. P.A. Sturrock, E. Fischbach, J.D. Scargle, "Comparative Analyses of Brookhaven National Laboratory Nuclear Decay Measurements and Super-Kamiokande Solar Neutrino Measurements: Neutrinos and Neutrino-Induced Beta-Decays as Probes of the Deep Solar Interior", Solar Physics, 291, 3467 (2016). Abstract. G. Steinitz, O. Piatibratova, P. Kotlarsky, "Sub-daily periodic radon signals in a confined radon system", Journal of Environmental Radioactivity, 134, 128 (2014). Abstract. G. Steinitz, P. Kotlarsky, O. Piatibratova, "Observations of the relationship between directionality and decay rate of radon in a confined experiment", European Physical Journal, 224, 731 (2015). Abstract. S. Davini, G. Bellini, J. Benziger, D. Bick, G. Bonfini, D. Bravo, B. Caccianiga, F. Calaprice, A. Caminata, P. Cavalcante, A. Chepurnov, D. D'Angelo, A. Derbin, A. Etenko, K. Fomenko, D. Franco, C. Galbiati, C. Ghiano, A. Goretti, M. Gromov, Aldo Ianni, Andrea Ianni, V. Kobychev, D. Korablev, G. Korga, D. Kryn, M. Laubenstein, T. Lewke, E. Litvinovich, F. Lombardi, P. Lombardi, L. Ludhova, G. Lukyanchenko, I. Machulin, S. Manecki, W. Maneschg, S. Marcocci E. Meroni, M. Misiaszek, P. Mosteiro, V. Muratova, L. Oberauer, M. Obolensky, F. Ortica, K. Otis, M. Pallavicini, L. Papp, A. Pocar, G. Ranucci, A. Razeto, A. Re, A. Romani, N. Rossi, C. Salvo, S. Schönert, H. Simgen, M. Skorokhvatov, O. Smirnov, A. Sotnikov, S. Sukhotin, Y. Suvorov, R. Tartaglia, G. Testera, D. Vignaud, R. B. Vogelaar, J. Winter, M. Wojcik, M. Wurm, O. Zaimidoroga, S. Zavatarelli, G. Zuzel, "New results of the Borexino experiment: pp solar neutrino detection", Il Nuovo Cimento C, 38, 120 (2015). Abstract.